When we baptize our children, we as their parents along with their godparents. Are promising to renounce Satan, and to believe in God and the Church on their behalf, and to commence their initiation and lead them into the light and grace of God and the Church. Just as our body and mind grows as we develop with age. So too does our soul mature and grow within the life of grace. When we are of age, we can take our Sacrament of Confirmation, that allows us to complete the promise made on our behalf, by our parents and godparents at our baptism. Baptism is a choice made on behalf of a child. Our childhood is a time of when we are told what to do, how to behave, and told what to believe. We respond to positive and negative reinforcements which influence our actions, choices and behavior. As we reach adulthood, even young adulthood, we start to make our own choices in life. We recognize for ourselves that which is right from wrong, and begin to take responsibility for our own actions. No longer do we do things simply for recognition or reward, but for merely doing that which is the right, for it is the right thing to do. The church allows Confirmation to be performed at the “age of reason” which can be as young as 12 years of age. 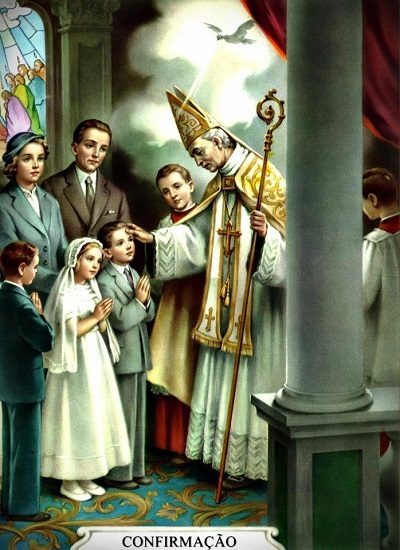 Following the early 1900’s, the age of reason for the first communion was lowered to around 7 years of age by Pope Pius X, but the age of reason for confirmation has remained at around 12. Today many parents choose to wait for their child to decide for themselves as to when they should take their confirmation, rather then trying to pressure them into taking it. By taking our Sacrament of Confirmation, we are renewing the promises that were made at our baptism, this time for ourselves, thus completing our initiation into the Catholic and Christian community. We now confirm our faith and strong commitment to God and the Church, and that we now accept full responsibility for our own faith, destiny and to help guide others into the fold. At baptism, the Holy Spirit is first introduced to the new Catholic as the entire Holy Trinity – the Father, the Son, and the Holly Spirit – are invoked during the ceremony, and touch the soul of the baptized. As such only someone that has been properly baptized can undertake the confirmation. If you are an adult convert or a returning Catholic that has not had their first communion or not performed your Confirmation, you will need to proceed with the RCIA process. The ceremony may take place at Mass, or outside of Mass. Normally the confirmation will be performed by the Bishop, though some priests however can be delegated to confirm adult converts at the Easter Vigil. While confirming Catholics in their diocese, the Bishop wears red vestments that symbolize the red tongues of fire seen hovering over the heads of the apostles at Pentecost. Each individual that is to be confirmed steps forward, they may stand or kneel before the Bishop (or priest), as their sponsor lays a hand on their shoulder. Catholics believe that we are born with the Fruits of the Holly Spirit, and that the same gifts that were bestowed upon the apostles at Pentecost, are also bestowed upon Catholics during their Baptism and strengthened with their Sacrament of Confirmation (Gal 5:22-23; CCC 736), (acts 2:1-4). These blessings are what give us our humanity, and the strength to resist sin, and help others.